It takes a lot of effort to make good fittings. At Hansgrohe, we do everything we can to develop and produce fittings that will provide many years of enjoyment in your bathroom. All products that bear the "Made by Hansgrohe" stamp have to satisfy demanding quality criteria and controls. They have also been tested and certified by numerous international organizations. Hansgrohe fittings shine with a wide variety of unique technical and design features - including ComfortZone, our generous sizing system for greater ease of use. 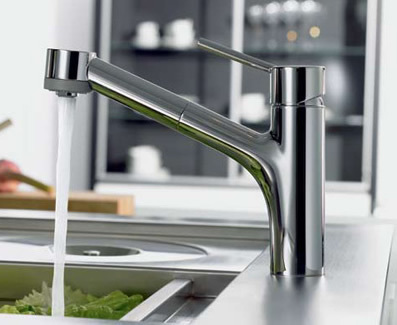 Hansgrohe Technology and Quality -- Also in the Kitchen. The pleasure of a good meal begins with cooking -- choosing fresh ingredients, washing and cutting the vegetables. 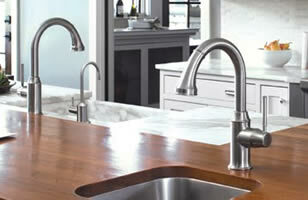 A Hansgrohe kitchen faucet is an attractive, reliable tool to help with all of these preparations. Solid workmanship, high-quality materials and sophisticated technology are the distinctive features of our faucets. Talis S: Distinctively Simple. 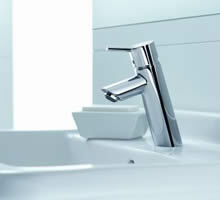 Talis S gets a fresh, new look with our new HighArc, SemiArc, prep and bar faucets. A distinctive, angular handle adds a well-chosen detail to this beautifully-designed kitchen series, with the understanding that when it comes to contemporary style, less is always more. Just as creating a great meal begins with choosing the right ingredients, great contemporary kitchens begin with Talis S.
Talis C: Timeless Classics for the Kitchen. The elegant forms of Talis C recall a simpler era. From the graceful curves of the trumpet-shaped spout to the delicate, scalloped edges of the handle, a familiar look is revealed, along with the attention to detail you would expect from Hansgrohe. Combined with innovative technology and workmanship to ensure a lifetime of superior usability and reliability, usher in your own renaissance of classic style with Talis C.
Talis C. With their subtle curves and traditional features, the Talis C lavatory faucets live up to their name, bringing classic elegance into the bathroom. Whether it be a spout with a graceful, pleasing shape or an open, waterfall-style spout -- enjoy a unique water and design experience. Talis S. The firm, straight lines and slim appearance are accentuated by the dynamic tilt of the faucet and the pin-style handle. Talis S is a popular, modern series in minimalist design. It adds life and verve to the bathroom, but in a calm and discreet manner.